Imagine a major breakthrough which Indian scientists achieve and PM Modi sending you a SMS to announce the good news. No, its not a fantasy anymore as it has become a reality. 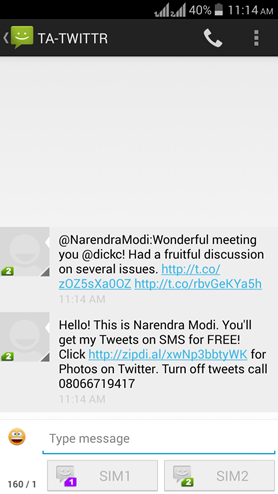 Powered by Zipdial, which Twitter had recently acquired (also their 1st Indian acquisition), this is the first instance of a Government tie-up with a 3rd party social network to send SMS directly to the citizens. Earlier, Shahrukh Khan had used Zipdial’s missed call platform to connect with his fans. He had advertised a phone number where his fans need to give a missed call, and all his Tweets would appear as SMS on that number. Even Gillette had run such a similar campaign on Facebook platform, using Zipdial platform. But after Twitter’s acquisition of Zipdial, this is their first major campaign, and definitely a first for any Indian politician to broadcast Tweets using SMS service. This new initiative can also be described as a bridge between smartphone features and feature phone users, as those who cannot afford smartphone or use Twitter can now access PM Modi’s tweets and know more about the things which Government is doing. Last year, PM Modi kicked off the Digital India vision with allocation of Rs 1 lakh crore, which had a goal of 9 key important tasks including spreading broadband to each and every corner of India. One of the major successes was providing 100% Internet connectivity to all 32 gram panchayats at a tribal taluka in Gujarat. Earlier this year, one of the biggest news of Digital India vision was providing free WiFi access at 2500 cities all over India, which had a budget allocation of Rs 7000 crore. First ever Internet of Things document has already been released by the Govt. and Indian Army will soon be on Cloud. 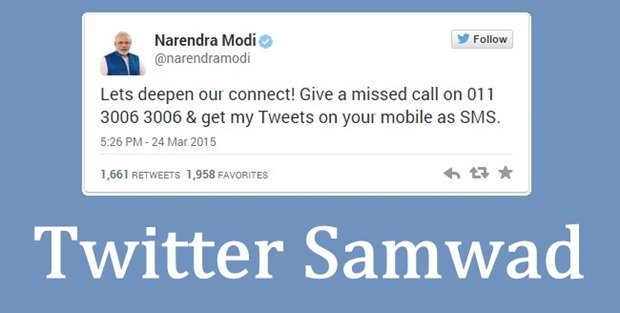 Do let us know about your views on Twitter Samvad initiative: Will it help in getting more transparency and more engagement with the Indian Government? How does one unsubscribe to this service? Or is it a one way subscription?